Our school has been invited to participate in the 30th annual MS Readathon for the month of June. Mrs Janice Frape (a veteran of fifteen visits to our school!) talked at an assembly today about the medical condition known as Multiple Sclerosis (MS). Students are encouraged to find sponsors and raise money to aid in researching MS. There are reading rewards and certificates for successful students. Those already reading for the Premier’s Reading Challenge can count any books read during this month as MS Readathon books. As usual, our students made us proud; we have trained them to be an excellent audience, and we always receive lots of warm fuzzies from guest speakers who find that they get a good hearing for their efforts. Coincidentally, a teacher-librarian colleague, new to the position, happened to mention today that they’d had an odd encounter with a teacher at their school. The teacher felt the T-L was not doing their job by insisting that three students read “a more appropriate book”, ie. one where each word could be understood by the students. The books in question were titles in the excellent “Zac Powers” series, by H I Larry. * Recreational reading (totally free choice, made by student, in their current realm of interests). As teacher-librarians we could easily be bouncing across all three levels with our students, depending on the task at hand, and the outcomes needing to be achieved. But it sounded to me like these students were using “Zac Powers” for recreational reading. And good on them! “Zac Powers” titles have labelled diagrams and humorous captions for a very good reason: because the author knows that many of his fans can’t read all of the main narrative text. Yet. Or would that teacher insist that poor readers in Year 6 only ever read “Hop on Pop” and never be allowed to look inside a “Guinness Book of World Records”? The annual National Simultaneous Storytime happened today at 11am: “Pete the Sheep” by Jackie French & Bruce Whatley, as a PowerPoint presentation on my school’s new interactive whiteboard! Thanks ALIA for a fun event! This afternoon, I’m being whisked off to Leichhardt to speak about wikis to educators in the Professional Association for Learning Support. Main points will include: what is a wiki? ; setting one up; and uses in the classroom. I’m hoping to impart: enthusiasm; the importance of being a practitioner in Web 2.0 (to become familiar and confident with its facilities); and tips for embeding ICT (information communication technologies) into pedagogy. Last year the School Libraries and Information Literacy Unit of NSW DET conducted a rap, Identity: Sharing Our Stories for Stages 3 and 4. Due to the success of this rap, via the Edublogs blogging facility, it is being run again this term! The rap addresses outcomes in English, HSIE, PDHPE, Music and Aboriginal Studies. It draws on a range of contemporary texts, including personal stories, to explore Aboriginal perspectives on what builds strong identity. The rap is helpful for cultural understanding for all students. It also supports the Stage 4 secondary COG unit, “Cultural identity”. Many teachers complain that they find it difficult to make sure they address Aboriginal perspectives in their programs correctly, and to find relevant resources to support their units of work in this area. Even if your school is not planning to participate, I would again urge teacher-librarians to visit the pages as the rap unfolds. Rapping is a great learning experience – for students, teachers, teacher librarians, AEOs (Aboriginal Education Officers) and community members. A range of excellent online resources is available, including: programming and planning, proformas, music, and online factual texts. 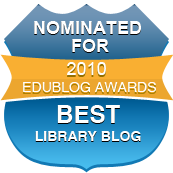 This rap offers an excellent way to develop an educator’s familiarity with blogging as an educational tool, embedded in your program of work. This year, our Year 5 students will be working in groups on the rap activities, and utilising our brand new interactive whiteboard (IWB), which is located in our library. Now that’s exciting! The new version of the Identity rap starts the week of 18 May 2009, and runs for about six weeks. Schools can use as much or as little, as suits their unique situations. The annual National Simultaneous Storytime is almost upon us again! 27th May, 11.00am. Our school had so much fun with “Arthur” last year, and we are sure the students will enjoy this year’s picture book, “Pete the sheep” by Jackie French and Bruce Whatley. 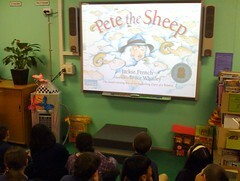 I just received an email from ALIA containing a link to a downloadable “Pete the sheep” PowerPoint presentation. (We’ll be able to use it to christen our new interactive whiteboard!) HarperCollins Publishers Australia has organised for “Pete the sheep” to be available as a PowerPoint presentation for NSS participants to assist with large storytime readings of the book. Register on ALIA’s site to access the PowerPoint file. The email also contained a link to some promotional “Pete the sheep” blackline activity sheets, drawn by Bruce Whatley himself, and these are also downloadable from the National Simultaneous Storytime site. Bruce is to be a special guest at Shoalhaven Libraries’ Storytime in Nowra, for those in that vicinity. Mmmm. How can we top that? Well, one of our teachers lives on a farm, and we are now wondering if she has a friendly sheep she can bring to school on the day? Today I had a relaxing break from the daily school library grind, travelling by two express service trains to Gosford, on the NSW Central Coast, to speak about wikis and blogs (eg. 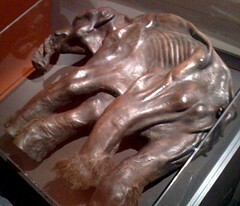 this one!) to teacher-librarians of schools in the Brisbane Waters group. I kept wondering why I wasn’t feeling too nervous about the presentation itself, but I guess I knew my topic and audience fairly well. As I warned them, I can talk all day (be warned!) but it was great to be given a sizable chunk (about 90 minutes) of their quarterly professional development session to share the learning journey and achievements of my students (and teaching colleagues) in the area of Web 2.0. Many thanks to Pam Howes and Christine Harpur for your wonderful hospitality! An updated slideshow of highlights the library renovations. 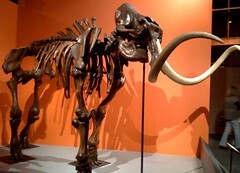 Mammoths on display at The Australian Museum, Sydney. Teachers’ preview last Wednesday night! 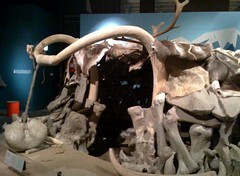 Recreation of a 300-bone Mizyn hut made of 273 mammoth bones, from 30 different mammoths (plus deer antlers and animal skins) on display at The Australian Museum, Sydney. What time is it when the clock chimes 13? Answer: Time to get a new clock. You may recall my emergency repair job on the library’s “Auckland” clock, part of our set of “newsroom” clocks in the revamped library? Well, the clock mechanism has failed again. 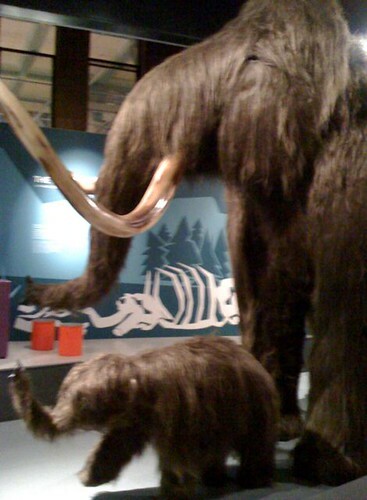 I can’t get it to run longer than a few minutes. I very much doubt I can buy a matching replacement for a clock bought six months ago “on special” – and, rather than put up with a clock that was always giving a totally random time, I decided to go back to an idea I used a few years ago when I was teaching Stage 1 full time. I’d realised that many students in that had no concept of a longcase grandfather clock, so I created one with corrugated artboard on the classroom wall, utilising the regular schoolroom clock that came with the room. We added a mouse to the clock when we were studying the nursery rhyme, “Hickory Dickory Dock”, and the students were shocked one day when the battery ran out right on the dot of one o’clock! At least it’ll also be the right time every lunchtime! I also took the opportunity to make a better version of my laminated “Time 4 Learning” signage, and changed the “Library Rules” chart to match the green colour of our core values signage. Previously, it had been white.